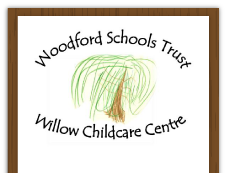 Woodford Schools Trust is a registered charity. Trustees are accountable for the management of the Trust. We receive funding for 3 and 4 year olds, to provide fifteen hours of free nursery education during term time for eligible children. Parents are the people who make the most significant difference in a child’s life, so we aim to form a partnership with them, right from the start. We believe in the importance of developing close relationships with families, recognising the positive influence this has on children and therefore we are available to talk at anytime. All children have a journal called the ‘Learning Journey’, which includes observations, photographs, drawings and artwork and documentation of the child’s progress. We hope parents will contribute to this and treat it as a shared document, one that we can all enjoy, and that it will be taken home to share with the family. We are committed to safeguarding children by protecting them from abuse and harm, and helping them to begin to learn how to keep themselves safe. We have a duty to inform Advice and Assessment – the Child Protection Statutory Social Work service – or the police if we have concerns about a child. We will talk to parents about our concerns and will seek their consent before we share them. The only times we will not discuss our concerns with parents or seek consent is if we have reason to believe it is not in the best interests of the child. We have a Safeguarding Children policy which is in line with Local Safeguarding Children Board guidance and procedures. This policy is available in the centre office and parents and carers can request a copy at any time. There is a designated person with responsibility for safeguarding children within the centre. The designated person is: Mary Andrew and in her absence: Kathy Cooper. the comments children make which give cause for concern. 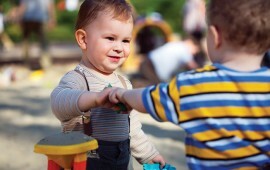 Babies and young children learn by doing things for themselves, by exploring and investigating, watching and listening, talking and discussing, creating and communicating – by playing. Our environment is organised so that all the children can become independent, confident and able to initiate their own learning. We aim for children to work collaboratively, where they can learn from each other in a social context. There are planned experiences each day led by an adult. Children may be invited to join these activities, but are equally encouraged to become engrossed in their own play. Each key person monitors the choices the children make, to ensure there is a balance of adult-led and child initiated activities. Some of the opportunities we offer children have the potential for getting messy e.g. painting, glueing, working with clay, outdoor play etc. The best way to avoid becoming upset about children getting messy, is to send them in play clothes that don’t matter. It is very sad when a child refuses to get involved in an activity in case they ‘get dirty’. We ask that parents encourage them to feel uninhibited and free to play. Children are learning all the time, from everything around them – their friends, the adults, the environment, the atmosphere, the routine, the experiences. Children are encouraged to be active participants in their own learning, giving them time to discuss their thoughts and ideas. Each day they are learning to communicate with others, explore, be sociable, plan and make decisions, problem-solve, investigate what and why things happen, ask questions and think for themselves. Babies and children are naturally curious and are driven to explore their world. It is our responsibility as educators and carers to help them become confident, competent learners in today’s society. We aim to create a listening climate, where adults respect and listen to children, acknowledging their actions, interactions, communications, conversations etc. This is done through close observation, practitioners record what they see and hear children doing. Words, photographs and video are used to capture the processes and make the learning visible – we call this documentation. This forms ‘display’ and can be found in and around the rooms to inform parents and others of ongoing interests and current work with the children. Observation and documentation help us to understand why children do what they do and therefore, plan a more appropriate curriculum. This can then be shared – with the children themselves, the parents and families and other professionals.